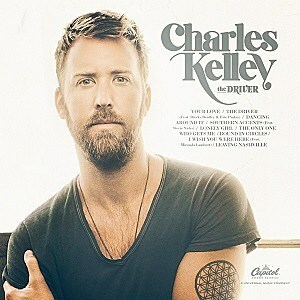 Released on February 5th, The Driver is the debut solo album from Charles Kelley. Perhaps best known as part of hit country group Lady Antebellum, Charles has released an album that calls upon aspects of a sound that will be familiar to fans of the group but also plays upon other influences, with a distinctly 'rootsier' overall feel. I've been a fan of Lady Antebellum since the release of their debut album but have sometimes found their music a little too sweet and poppy so I was immediately intrigued to hear what Charles would release on his own - I am incredibly impressed by what this album brings. There are a good mix of tracks here and Charles' distinctive tone seems to sit comfortably in each one of them. The album's title track was the lead single and features vocals from Dierks Bentley and Eric Paslay alongside Charles. The contemplative tone of the track works incredibly well and carries the listener along through it with it's alternating instrumental lines and the differing voices. In terms of the vocals however, the unfortunate thing that struck me is that Eric's vocal feels overshadowed by Charles and Dierks. This in no way detracts from the track but the overall production seems to suit Charles and Dierks so well that Eric feels a little forgotten. It is, however, a very strong introduction to Charles as a solo artist. Opening number Your Love has to be one of my favourite tracks on the album. Instantly calling on you to tap your feet and turn it up loud, the track is incredibly catchy and is a great choice to open the album. With it's pounding drum beat and pacey melody Your Love allows a rockier side to Charles' vocals to be showcased (with a lot of success! ), I can imagine that it is a great track to have as part of a live set. I'm not really a fan of Miranda Lambert so I was a little dubious to hear what she would bring to I Wish You Were Here but I honestly love the track. Miranda brings a fragility to her vocal which works really well and the harmonies between her voice and Charles' are brilliant. Both Miranda and Charles deliver emotive vocals that will inevitably draw listeners in and the lyrics of the chorus in particular cement that. The Only One Who Gets Me is a really sweet moment. Dedicated to his wife Cassie, the track is clearly very personal to Charles and his vocal shows that emotion. The instrumentalisation is really strong, with a soft drum line and electric guitar hook leading the melody. Lines like "who puts me back together when it all goes wrong" and "home. that's what you feel like" are really touching and paint a story that is sure to be both relatable and popular with a lot of listeners. There are, however, a couple of minor niggles I have with this album. The bluesy feel to the verses of Lonely Girl is great and incredibly effective and then the track brings in disco influences for the chorus which is just odd and sticks out awkwardly - I would have personally preferred that the blues feel was built upon throughout the whole track, it would have been interesting to hear what that would have done to the chorus. Also, whilst Charles' cover of Tom Petty's Southern Accents is very strong, the shine is taken off it by Stevie Nicks vocals in my opinion. Charles and Stevie's voices don't really blend very well and Stevie's vocal doesn't feel as though it really fits in comfortably alongside the rest of the track. Whilst it would be a shame if we didn't hear any future releases from Lady Antebellum I will certainly welcome more solo albums from Charles. The Driver is undoubtedly a remarkable album with impressive musicians, lyrics and instrumentalisation that showcases Charles very well, I'd definitely recommend it. Labels: Charles Kelley "The Driver"